The lovely folks over at Calzedonia sent me a package filled with some treats last week. I shared a quick snap on Instagram then and there, but I thought I'd show you each piece properly here. The leopard print leggings with my latest pair of black flats and a black skater skirt. I would most probably wear this with a crisp white blouse, a chunky necklace, black blazer and a red hand bag. 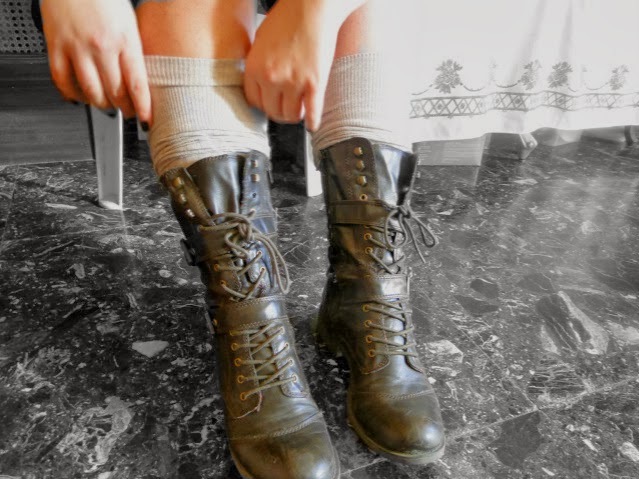 The Beige knee-length stockings.. now I'm not one to be walking around with knee length stockings to I scrunched them down to my combat boots. I'd wear this with a khaki dress and burgundy handbag, might add skin color tights if it's too cold..
My favorite of the three goodies, black lace/velvet floral print tights. Oh my god, these are SO pretty! You can dress them up or down.. depending on your mood. I went with black on black, and this is a sneak peek from the outfit post coming your way this week. Drop a comment or send me a tweet with your answer!